Heat gas or charcoal grill. Cut 4 (18 x 12-inch) sheets of heavy-duty foil. 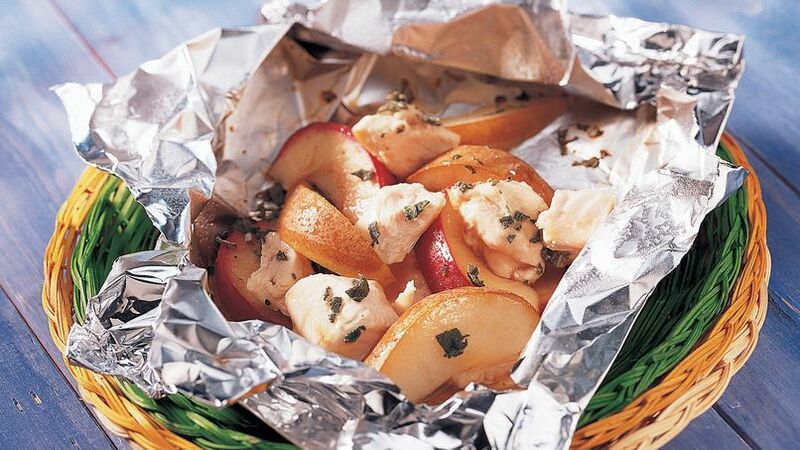 Place one-fourth of the chicken, pears and apple on center of each sheet. Drizzle each with vinegar; sprinkle with sage and salt. Place packets on grill over medium heat. Cover grill; cook 10 to 15 minutes, rotating packets 1/2 turn after 5 minutes, or until chicken is no longer pink in center. Place foil packets on plates. Cut large X across top of each packet; carefully fold back foil. Pears are loaded with fiber to keep things moving. Start slowly so your body has time to get used to more fiber. Cut-up chicken breast right from the meat case and foil make this recipe a breeze to prepare and clean up!